In the U. S. and around the world, we are mired in political conflicts that are filled with bitterness and hatred, prejudice, and personal attacks, leading to increased stereotyping and discrimination, adversarial assumptions, divisive language, and antagonistic zero-sum, power- and rights-based processes that unnecessarily pit us against each other and diminish our ability to work together to solve problems that increasingly impact all of us. The problem is, we haven’t figured out yet how to discuss political ideas and beliefs in ways that lead to learning, collaborative outcomes, increased empathy, mutual understanding, and joint problem solving. Gathered by Kenneth Cloke and illustrated by Brad Heckman, this collection of interesting, insightful and inspiring quotes will excite and energize you, enrich your wisdom, and encourage you to use what you learn to improve your life and the lives of others. Some are simply beautiful, or elegant, or so profound they will take your breath away. What links them is their honesty and courage, their pursuit of what is true, and their ability to force us out of the rut of accepted, established beliefs that are too simple, too comfortable, too orthodox to match the complexity of our lives. It is increasingly clear that our most pressing problems are global in nature, and cannot be solved using military, competitive, or adversarial processes. Instead, we require dialogue, collaboration, and a full range of conflict resolution techniques to invent and implement the deeper, more lasting changes that are needed. "Conflict Revolution" is an effort to apply these principles to social, economic, political and environmental conflicts, and design alternative ways of preventing and resolving chronic global conflicts. Read mediator Victoria Pynchon's book review of Conflict Revolution for JDSupra.com. Sometimes it's necessary to push beyond the usual limits of the mediation process to achieve deeper and more lasting change. 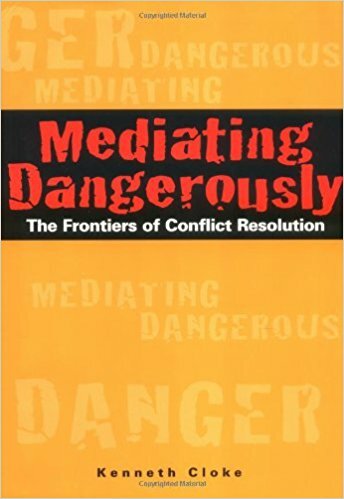 Mediating Dangerously shows how to reach beyond technical and traditional intervention to the outer edges and dark places of dispute resolution, where risk taking is essential and fundamental change is the desired result. It means opening wounds and looking beneath the surface, challenging comfortable assumptions, and exploring dangerous issues such as dishonesty, denial, apathy, domestic violence, grief, war, and slavery in order to reach a deeper level of transformational change. 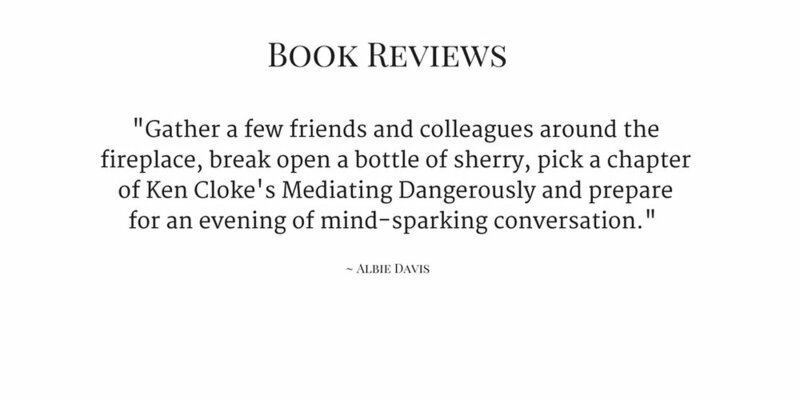 Read a review and summary of Mediating Dangerously by the Conflict Research Consortium Staff. "The Dance of Opposites: Explorations in Mediation, Dialogue and Conflict Resolution Systems Design" explores a new vision for conflict resolution, a “conflict revolution” that analyzes the use of language in conflict, the narrative structure of conflict stories, and how the brain responds to conflict. It surveys religion, spirituality, and meditation, and searches for ways of opening heartfelt communications between opponents. "The Dance of Opposites" also looks at social, political, and environmental conflicts, and offers suggestions on how to organize and conduct dialogues over difficult, dangerous, and controversial issues. It identifies new ways of designing conflict resolution systems for marriages, families and couples, and chronic organizational conflicts. It investigates dialectical philosophy, movements for social change, and theories of justice, encouraging us to use conflict to learn, become better human beings, and create opportunities for improvement. The Crossroads of Conflict - A Journey into the Heart of Dispute Resolution is an effort to reveal the hidden dynamics and underlying unity that lie at the heart of conflict resolution. Its aims are to reveal the immense creative power of conflict resolution and to guide people toward resolution, transformation, and transcendence - not through sentimentality or wishful thinking, but insight, understanding, and practical, replicable techniques. The Crossroads of Conflict is, in short, both a practical guide for anyone seeking to create profound, satisfying, heart-felt conversations with their opponents, and a set of penetrating theoretical reflections and explanations for why conflict resolution has proven so successful in helping people resolve, transform, and transcend their conflicts. A compendium of articles, case studies, lists of methods and techniques and other miscellaneous items drawn from my experience as a mediator. It was first published in 1996 and is now available on Kindle by popular demand. It is a kind of extended training manual with lots of disjointed lists, rather than a text that flows smoothly from one topic to another. This is a practical guide to meditation written especially for mediators. It captures the beauty of meditation, and offers a guide to a variety of meditative practices and what connects them, a set of interesting and inspirational quotes about meditation practice, and a description of how it intersects and supports the practice of mediation and conflict resolution. Resolving Conflicts at Work is a guide for preventing and resolving conflicts, miscommunications, and misunderstandings at work, including dozens of techniques for revealing how the inevitable disputes and divisions in the workplace are actually opportunities for greater creativity, productivity, enhanced morale, and personal growth. In the third edition of this text, all chapters are completely infused with additional content, updated examples, and new case studies. Like its predecessors, it identifies core strategies for preventing and resolving both intermittent and chronic conflicts in the workplace. This definitive and comprehensive work provides a handy guide for managers, employees, union representatives, human resource experts, and consultants seeking to maintain stable and productive workplaces. Learn how personal and organizational conflicts can be resolved by listening closely to the 'stories' people tell when they are in conflict, understanding why people tell their stories in the ways they do, and creating a third story that brings them together. 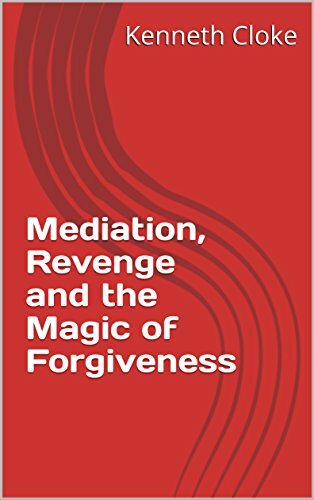 This visionary book is written by Kenneth Cloke and Joan Goldsmith, two renowned mediators, who have used the narrative structure method successfully in their own mediation practice to move people in conflict from stubbornness, hostility, and fear to openness, collaboration, and forgiveness. Focusing on the transformative power of stories, Resolving Personal and Organizational Conflict includes an array of case studies from the authors' first-hand experience with thousands of clients. These case studies include the perspectives of all the parties in the conflict and cover a wide range of conflicts and disputes. In The Art of Waking People Up authors Kenneth Cloke and Joan Goldsmith draw on more than thirty years of practical experience with hundreds of organizations-- from Fortune 500 companies to government agencies, schools, and nonprofits-- to reveal new ways of giving and receiving feedback that maximize personal and organizational change and foster lifelong learning. They show how organizations can develop the systems, processes, techniques, and relationships that affirm, rather than undermine, the intelligence and humanity of their employees. This important resource is filled with the necessary tools, interventions, and strategies managers can use to encourage their employees to speak, hear, absorb, and use the information they need to improve the way they work. There is a search in process for a new context and paradigm for the organization of the future-an organization that must be capable of producing high-quality, competitive products that satisfy customers without destroying the planet or degrading human life. The End of Management and the Rise of Organizational Democracy calls for a radical set of organizational development initiatives that will combat the destructive forces of globalization, put an end to authoritarian, paternalistic management, and move organizations toward a new "organizational democracy." Kenneth Cloke and Joan Goldsmith detail the practical opportunities, alternatives, and models for these new organizations and challenge leaders to transform their workplace environment into one shaped by a context of values, ethics, and integrity. They reveal how a combination of collaboration, self-management, and organizational democracy can break down long-standing boundaries and foster the far-reaching, sustainable changes critical to success in the twenty-first century. Can you imagine how rewarding it would be, each day, to truly enjoy going to work? For more than 30 years, authors Joan Goldsmith and Kenneth Cloke have worked with teams and employers to create positive work environments in which communication between all levels is respectful, creativity is encouraged and people are acknowledged and supported. Thank God It's Monday! provides real-world examples and exercises to stimulate employees and employers into creating better work lives. Thank God It's Monday! identifies 14 core values that will make any work more stimulating and satisfying, including: Inclusion of everyone; Celebration of diversity; Open and honest communication; Risk taking; Opportunities for personal growth; Thank God It's Monday! will be valuable to employees seeking to increase satisfaction in their current jobs, displaced employees searching for the work situations that are best for them, and employers and organizational leaders looking to keep their best employees by creating energetic and vibrant workplaces. Thank God It's Monday! provides scores of ready-to-use activities, worksheets and exercises that will help transform the workplace into a second home that everyone wants to return to each day.